Early Minyan Kiddush is sponsored by Dr. & Mrs. Yakov Weil on the occasion of the Ufruf of their son Ephraim. Mrs. Millie Prero and Mr. & Mrs. Gavriel Prero on the occasion of the yahrtzeit of Joseph Klein a”h, Millie’s father and Gavriel’s grandfather. Mr. & Mrs. Leonard Cohen on the occasion of Leonard’s 30th anniversary of his 50th birthday. Dr. & Mrs. Yakov Weil on the Ufruf of their son Ephraim. Mr. & Mrs. Jay Miller and Rabbi & Mrs. Ephraim Polatsek on the recent marriage of their children, Miriam & Zevy. Rabbi & Mrs. Shlomo Rosen on the birth of a granddaughter, born to Avi & Gila Radon. Mr. & Mrs. Steve Miretzky on the birth of a granddaughter, born to Tzvi Yaakov & Rifka Miretzky. 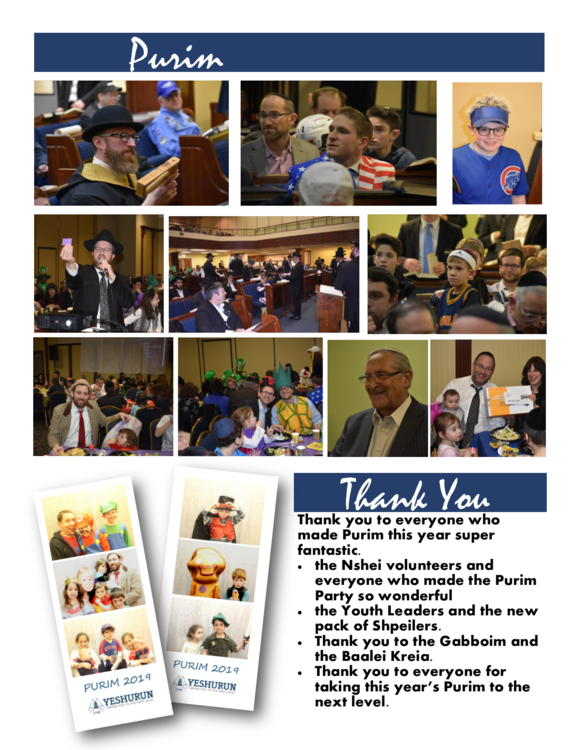 Thank you to everyone who made Purim this year super fantastic. The Youth Leaders and the new pack of Shpeilers. Thank you to the Gabboim and the Baalei Kreia. Thank you to everyone for taking this year’s Purim to the next level. ​​​​​​​Mazel Tov to the winners of this year’s Purim Raffle and thank you to all the donors, sponsors and vendors. Mr. & Mrs. Frank Kleinerman on the occasion of the yahrtzeit of Susan’s father. Mrs. Susie Robinson on the Bar Mitzvah of her grandson, Yosef Robinson, son of Rabbi Josh and Danielle Robinson. Rabbi & Mrs. Avrohom Reifer on the engagement of their granddaughter, Shana, to Mordechai Heber. Mr. & Mrs. Joe Zimmerman on the birth of a grandson born to Shmuel & Jessica Zimmerman. Mrs. Rifky Schwarcz on the birth of a grandson born to Tzippy & Nosson in Cleveland. Nshei Yeshurun invite you to join us for an Emoji Purim Party on Wednesday, March 20 after the Megillah reading. Please see attached flyer for details. Reservations at www.adasyeshurun.com/purim. Please note: The deadline is/was Thursday. Surge pricing will be in effect Friday-Monday. In order for us to plan properly, no reservations will be received after 11:00am Monday, March 18. 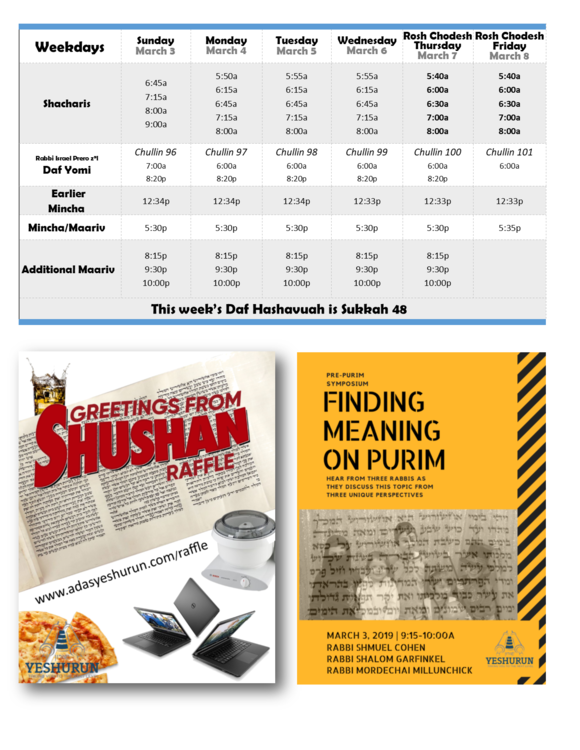 The “Greetings From Shushan Raffle” website is now live at www.adasyeshurun.com/raffle. There are some new and cool prizes this year including a chance to win a brand new Megillah, sparkling jewelry and a sous vide. Megillah drawing will be at 1:00pm on Wednesday. All other prizes will be drawn at the seuda on Wednesday night. Matanos L’Evyonim can be given online at www.adasyeshurun.com/matanos. If you are donating with a check please mark clearly Matanos L’Evyonim so that the funds can be distributed on Purim. 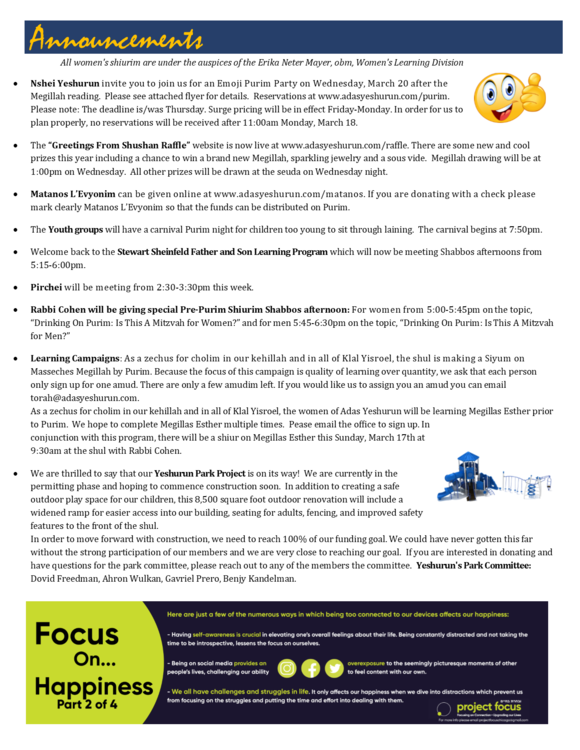 The Youth groups will have a carnival Purim night for children too young to sit through laining. The carnival begins at 7:50pm. 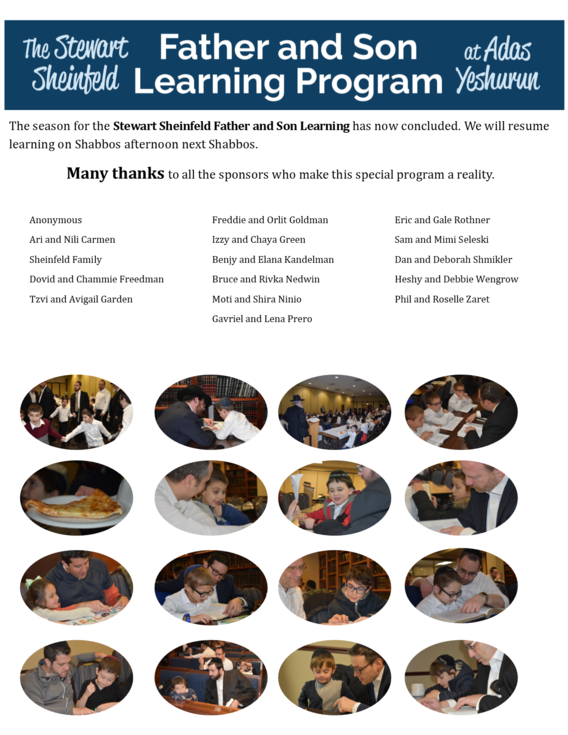 Welcome back to the Stewart Sheinfeld Father and Son Learning Program which will now be meeting Shabbos afternoons from 5:15-6:00pm. Pirchei will be meeting from 2:30-3:30pm this week. As a zechus for cholim in our kehillah and in all of Klal Yisroel, the shul is making a Siyum on Masseches Megillah by Purim. Because the focus of this campaign is quality of learning over quantity, we ask that each person only sign up for one amud. There are only a few amudim left. If you would like us to assign you an amud you can email torah@adasyeshurun.com. 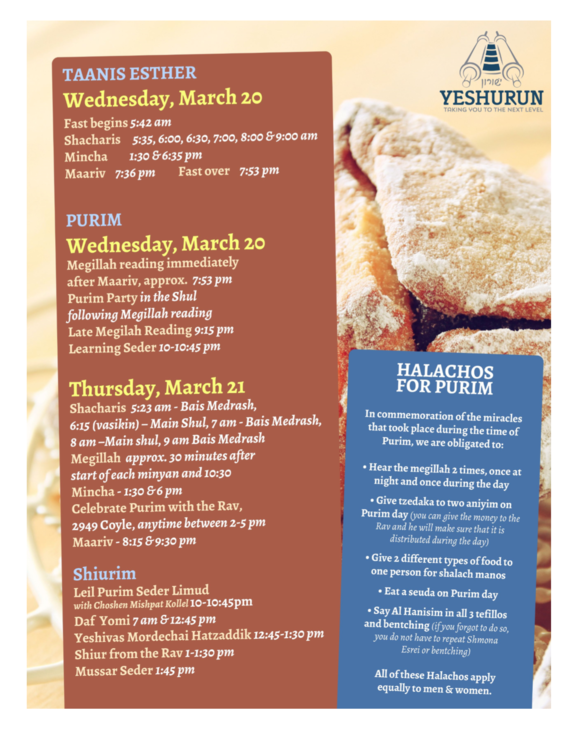 As a zechus for cholim in our kehillah and in all of Klal Yisroel, the women of Adas Yeshurun will be learning Megillas Esther prior to Purim. We hope to complete Megillas Esther multiple times. Pease email the office to sign up. In conjunction with this program, there will be a shiur on Megillas Esther this Sunday, March 17th at 9:30am at the shul with Rabbi Cohen. We are thrilled to say that our Yeshurun Park Project is on its way! We are currently in the permitting phase and hoping to commence construction soon. In addition to creating a safe outdoor play space for our children, this 8,500 square foot outdoor renovation will include a widened ramp for easier access into our building, seating for adults, fencing, and improved safety features to the front of the shul. In order to move forward with construction, we need to reach 100% of our funding goal. We could have never gotten this far without the strong participation of our members and we are very close to reaching our goal. If you are interested in donating and have questions for the park committee, please reach out to any of the members the committee. Yeshurun's Park Committee: Dovid Freedman, Ahron Wulkan, Gavriel Prero, Benjy Kandelman. A donation has been made to the Kiddush Fund in honor of Brad Olswang finishing his 100th blatt Gemora Rashi by his chavrusa. Mr. & Mrs. Brad Olswang on the occasion of the yahrtzeit of their son, Yaakov Lev a”h. Mr. & Mrs. Benjy Kandelman and family in memory of David Kandelman z"l .
Mr. & Mrs. Gershon Friedman on the upcoming wedding of their daughter Chanala to Moshe Jakofsky. Mr. & Mrs. Daniel Novick on the birth of a grandson, born to Tzvi & Adina Novick. 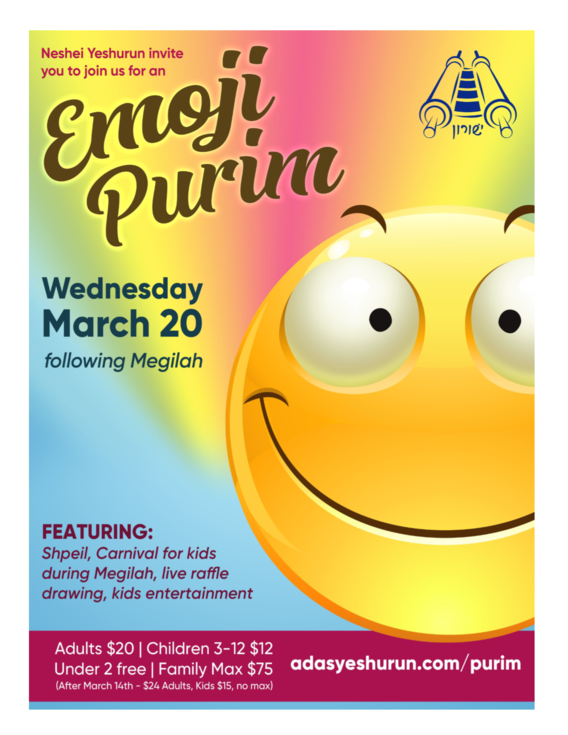 Nshei Yeshurun invite you to join us for an Emoji Purim Party on Wednesday, March 20 after the Megillah reading. Please see attached flyer for details. Reservations at www.adasyeshurun.com/purim. Please note: In order for us to plan properly, Please reserve by Thursday, March 14. Reservation prices increase Friday, March 15. No reservation will be received after 11:00am Monday, March 18. 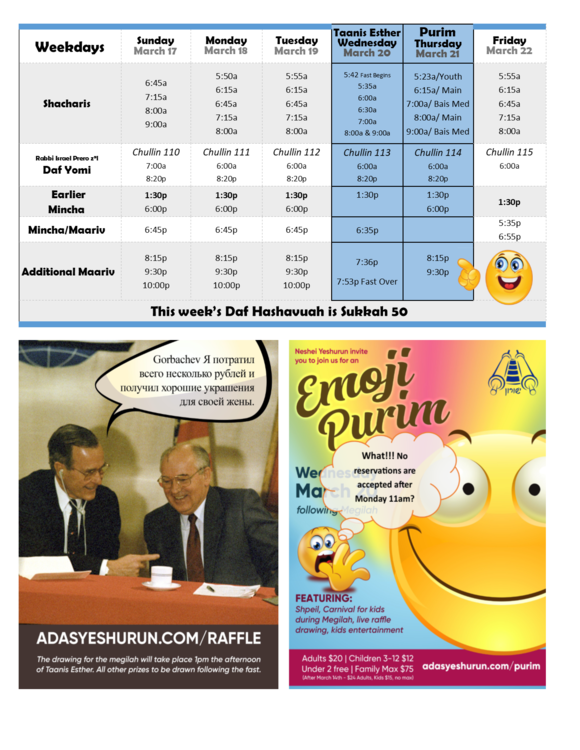 The “Greetings From Shushan Raffle” website is now live at www.adasyeshurun.com/raffle. There are some new and cool prizes this year including a chance to win a brand new Megillah, sparkling jewelry and a sous vide. 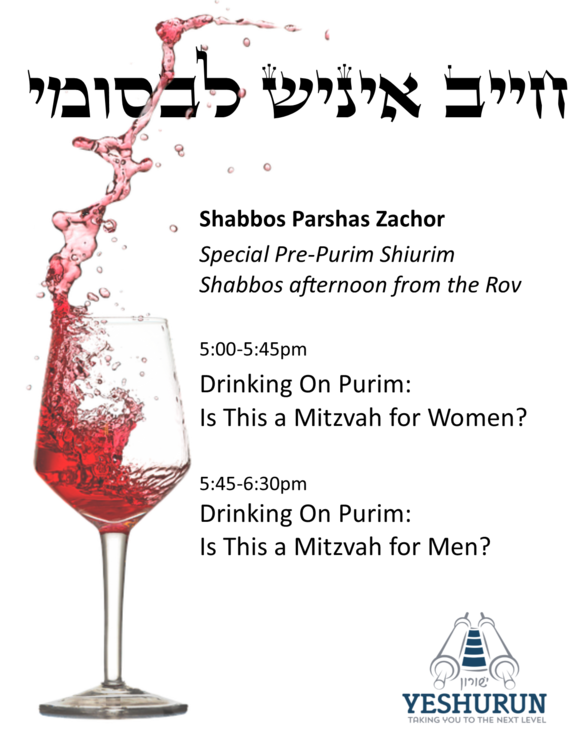 Rabbi Cohen will be giving a special Purim shiur for men and women titled, העיר שושן צהלה ושמחה this Tuesday night 7:45-8:30pm. Pirchei will not be meeting this week. 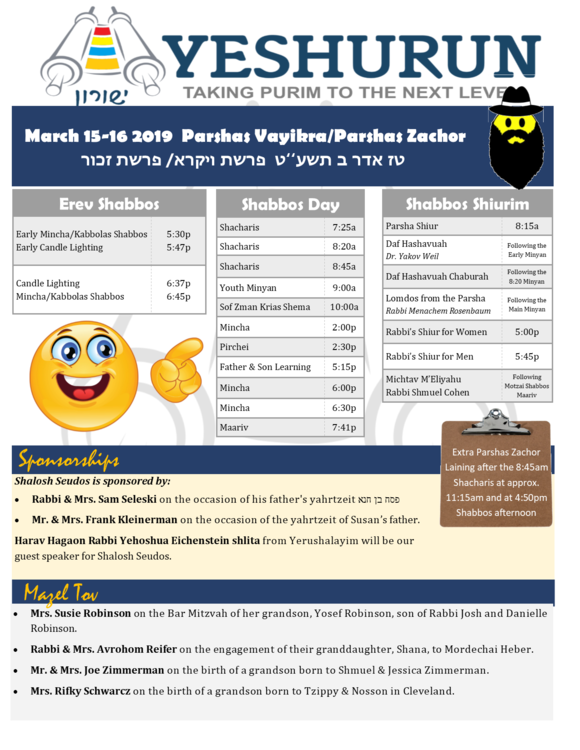 Learning Campaign: As a zechus for cholim in our kehillah and in all of Klal Yisroel, the shul is making a Siyum on Masseches Megillah by Purim. Because the focus of this campaign is quality of learning over quantity, we ask that each person only sign up for one amud. There is a signup sheet posted in the Bais Medrash. If you would like us to assign you an amud you can email torah@adasyeshurun.com. Kudos to everyone who made the Motzai Shabbos Melava Malka Wine Event a success! 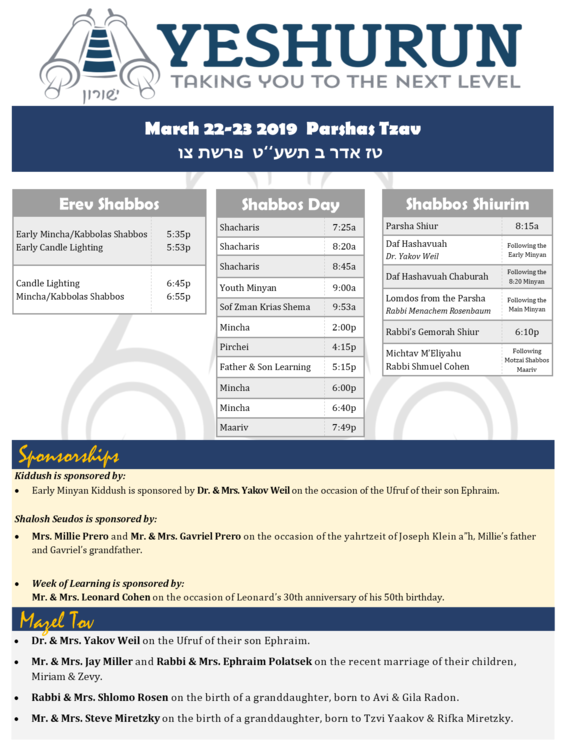 Rabbi Shlomo Rosen gave a fascinating talk about wine and Torah and Shulim Knobloch from Kol Tuv discussed various types of wine that can be used for the mitzvos of Purim and Pesach. Thanks to Ellie & Rachel Fliegelman and Elana Kandelman for arranging this wonderful evening. 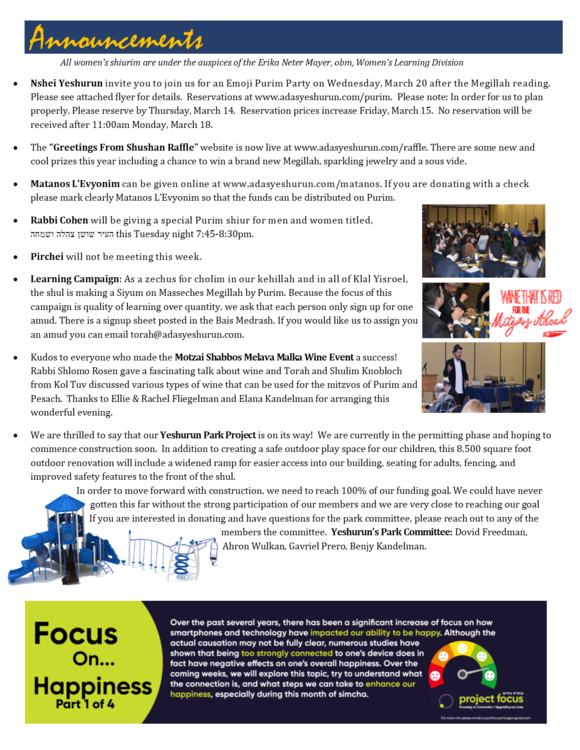 We are thrilled to say that our Yeshurun Park Project is on its way! We are currently in the permitting phase and hoping to commence construction soon. In addition to creating a safe outdoor play space for our children, this 8,500 square foot outdoor renovation will include a widened ramp for easier access into our building, seating for adults, fencing, and improved safety features to the front of the shul. In order to move forward with construction, we need to reach 100% of our funding goal. We could have never gotten this far without the strong participation of our members and we are very close to reaching our goal. If you are interested in donating and have questions for the park committee, please reach out to any of the members the committee. Yeshurun's Park Committee: Dovid Freedman, Ahron Wulkan, Gavriel Prero, Benjy Kandelman. A donation to the Kiddush fund has been made by Mr. & Mrs. Allan Arnet in celebration of Dr. & Mrs. Avy Dachman for Avy becoming this year’s Chicago Radiological Society’s Gold Medal honoree. The 8:20 Kiddush is sponsored by Mr. & Mrs. Brad Olswang on the occasion of the yahrtzeit of their son Yaakov Leib a”h. Mr. & Mrs. Perry Miller in memory of his brother, Rafael Feivel Shenur Ben Zvi Dov. Mr. & Mrs. Robert Kandelman on the occasion of the yartzeit of their son, David a”h. Rabbi & Mrs. Menachem Kirshner on the occasion of the yahrtzeit of their son, Reuven a”h. Mr. & Mrs. Leonard Cohen on the upcoming wedding of their grandson Simi Warso. Mr. & Mrs. David Meyers on the birth of a grandson born to Efrona & Avi Shane of Baltimore. 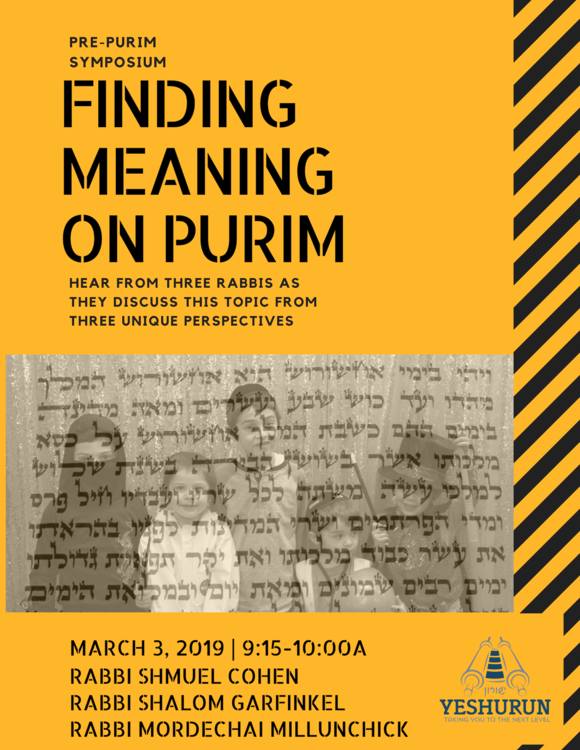 Please join us this Sunday, March 3 at 9:15am for a special Pre-Purim Symposium for men and women with Rabbi Shmuel Cohen, Rabbi Shalom Garfinkel and Rabbi Mordechai Millunchick who will speak on the topic, “Finding Meaning on Purim”. Join us for a Melava Malka Motzai Shabbos, March 2 at 8:00pm. 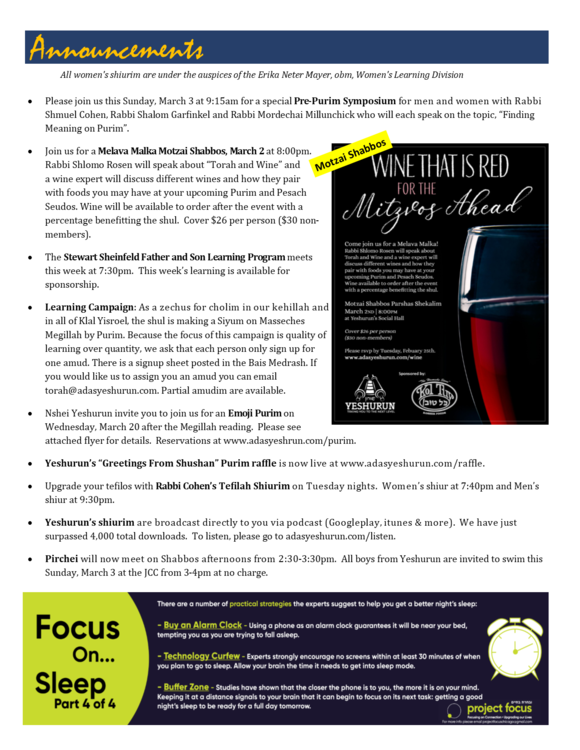 Rabbi Shlomo Rosen will speak about “Torah and Wine” and a wine expert will discuss different wines and how they pair with foods you may have at your upcoming Purim and Pesach Seudos. Wine will be available to order after the event with a percentage benefitting the shul. Cover $26 per person ($30 non-members). The Stewart Sheinfeld Father and Son Learning Program meets this week at 7:30pm. This week’s learning is available for sponsorship. 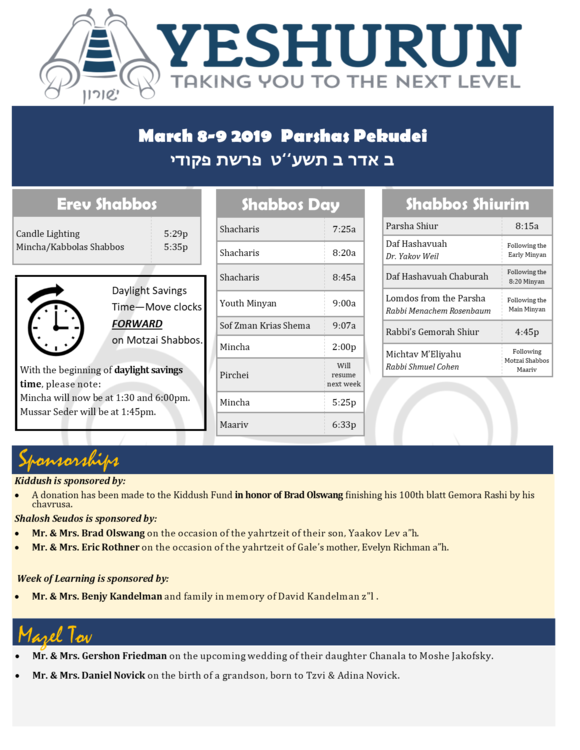 Learning Campaign: As a zechus for cholim in our kehillah and in all of Klal Yisroel, the shul is making a Siyum on Masseches Megillah by Purim. Because the focus of this campaign is quality of learning over quantity, we ask that each person only sign up for one amud. There is a signup sheet posted in the Bais Medrash. If you would like us to assign you an amud you can email torah@adasyeshurun.com. Partial amudim are available. 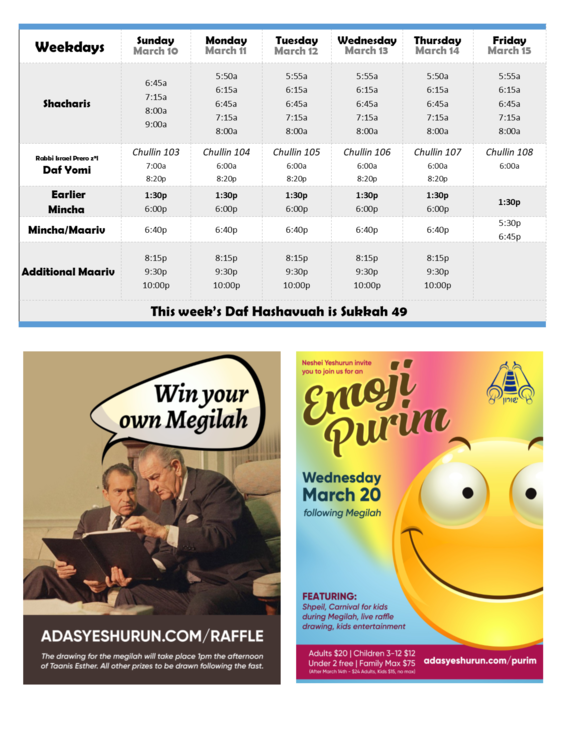 Nshei Yeshurun invite you to join us for an Emoji Purim on Wednesday, March 20 after the Megillah reading. Please see attached flyer for details. Reservations at www.adasyeshrun.com/purim. Yeshurun’s “Greetings From Shushan” Purim raffle is now live at www.adasyeshurun.com/raffle. Upgrade your tefilos with Rabbi Cohen’s Tefilah Shiurim on Tuesday nights. 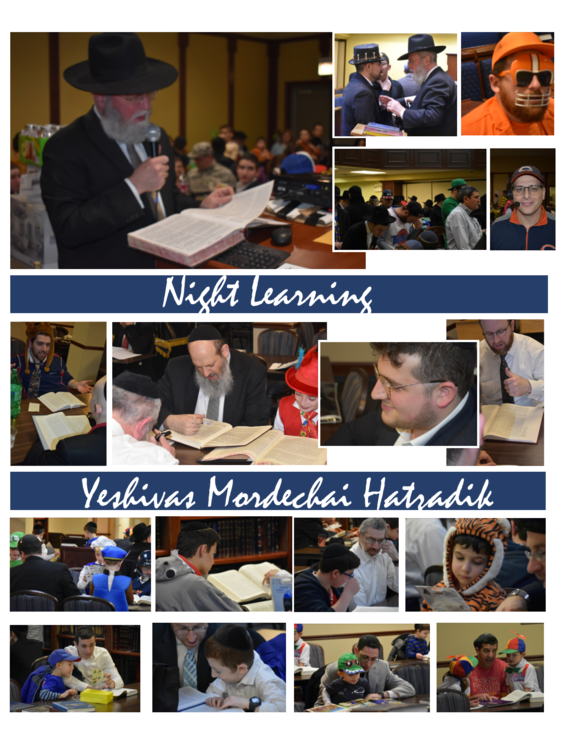 Women’s shiur at 7:40pm and Men’s shiur at 9:30pm. Yeshurun’s shiurim are broadcast directly to you via podcast (Googleplay, itunes & more). We have just surpassed 4,000 total downloads. To listen, please go to adasyeshurun.com/listen. 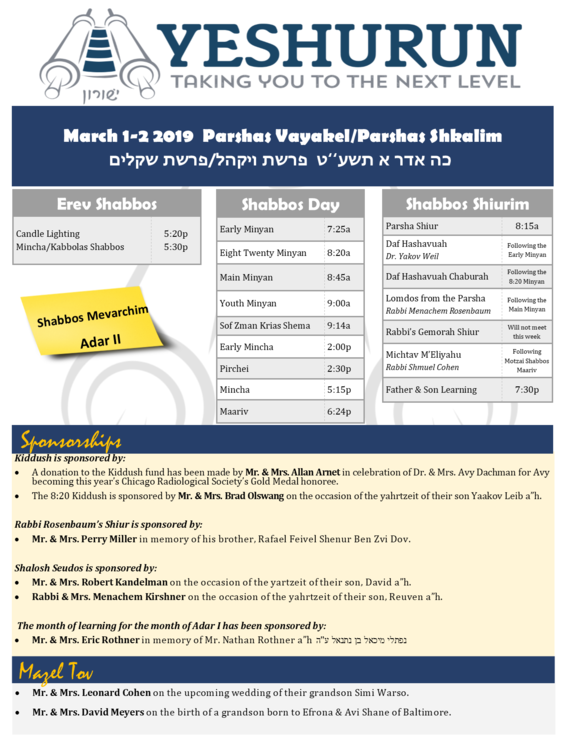 Pirchei will now meet on Shabbos afternoons from 2:30-3:30pm. All boys from Yeshurun are invited to swim this Sunday, March 3 at the JCC from 3-4pm at no charge.